Reading this book was like watching the movie Inception. There are a thousand and one threads to keep track of (whose dream are we in now? ), and then when I got to the end, I immediately wanted to go back to the beginning and try to collect all the stray pieces of story I missed. I wish I'd had someone sitting next to me while I was reading Long Division to answer all the questions that cropped up. The premise of the book itself is fairly complex, and the complications only increase as the characters skip back and forth through time. Yes, time travel! Here's the setup: City Coldson is fourteen years old in 2013 Jackson, Mississippi. After going on a public rant in response to blatant racism at the national “Can You Use the Word in a Sentence Bee,” City becomes an unwitting YouTube celebrity. 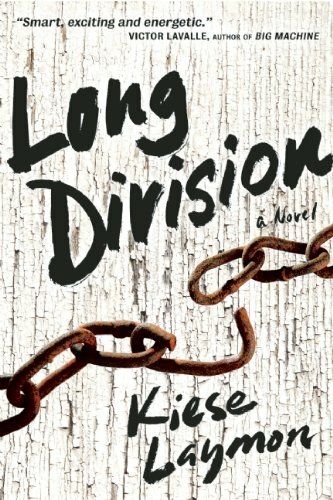 His mother swiftly exiles him to his grandmother's house in the small town of Melahatchie, MS.
Before he leaves town, City finds a book called Long Division in the principal's office at his school. Drawn to the book partly because it doesn't seem to have an author, City asks if he can borrow it. When he opens it, he finds a story about a teenage boy named City Coldson. But this City Coldson lives in 1985. And, along with his friend and possible love interest Shalaya Crump, he can travel through time using an old hatch hidden in the woods. So the entire book is narrated by City, it's just that 1985 City and 2013 City aren't the same person. Or not exactly the same. I enjoyed myself the most when I approached this book as science fiction. When I tried to come at it expecting realism, I ended up frustrated, but when I consciously decided to accept whatever came next, I was able to float along with the story's current and enjoy the ride. A hole in the ground that sends you back to 1964 or ahead to 2013? Sure, why not. Black kids dancing with Klan members to Outkast? That makes sense. A talking cat? Bring it on. What's fascinating, though, is how Laymon uses these sci-fi elements to tell a very realistic story about how it feels to be City Coldson, a black teenager in the South. The passages in which City tries to make sense of the storm of emotions inside him—about the way he is treated at the competition, about his complicated relationship with a rival student, about how his choices now affect the future—are incredibly powerful. As for the parts of the book I didn't fully grasp, I'm going to assume that's on me and not the author. I just wish I'd had someone to annoy with all my questions. Newer:Aquarium by David VannOlder:RWH Book Club: Help Choose the First Book!